 The mastermind behind the Enchanted Tales series appears to be Diane Eskanazi, operating as Golden Films. The company was founded by Ms Eskanazi in 1992 as a joint US-Japanese enterprise to produce very low-budget versions of a lot of the current Disney titles, complete with catchy songs to progress both the action and character development, a la Disney. Their catalog includes the following very-familiar titles - Snow White, Hercules, Pocahontas, The Beauty and the Beast, The Hunchback of Notre Dame, Alladin and The Little Mermaid. A couple of their titles used slightly different names, but it was not difficult to identify their inspirational source. For example, The Chinese Princess drew heavily upon Mulan, and The Jungle King, about a struggle for succession amongst a group of lions, strongly resembled The Lion King. 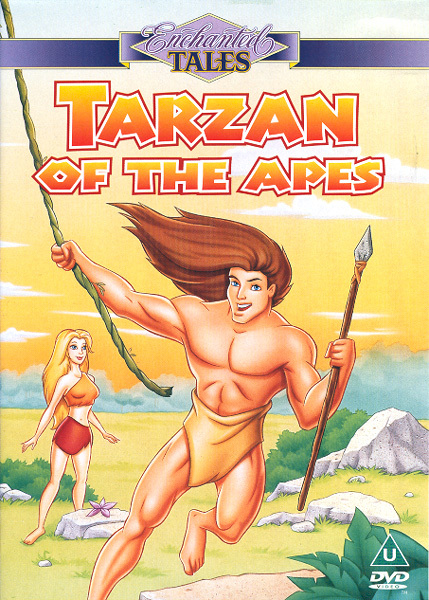 And of course, Tarzan, which had been in development at Disney for several years but was released first by Golden Films (see Disney's Tarzan ). The only thing that can be said in it's favour is that of all 52 Tarzan films this one most closely follows the original work by Edgar Rice Burroughs.  John and Alice Clayton (Lord and Lady Greystoke) are stranded on the west coast of Africa following a mutiny on board their ship. Alice gives birth to a son and following the death of both parents the baby is adopted by a female ape named Kala. Young Tarzan grows into a strong and very agile man and impresses his ape friends when he defeats Bolgani the gorilla (see image above). However, he always feels as if he doesn't quite belong amongst his ape family. 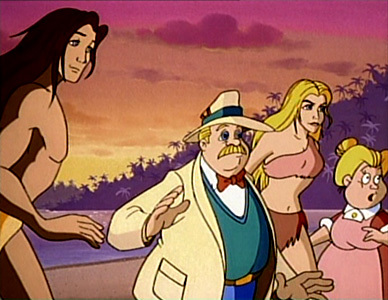 His first encounter with his own kind is when he meets Jane Porter (second from right), her father, Professor Porter (second from left), and their maid, Esmerelda (far right), who have been shipwrecked near his parents' cabin. Tarzan defeats Kerchak, the leader of the ape band, when he kidnaps Jane and he and Jane fall in love. Their romance is cut short when a rescue party arrives. One of the party, Lieutenant D'Arnot, is captured by natives. 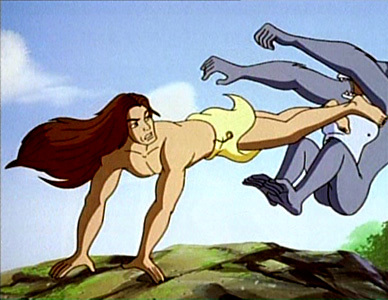 Tarzan rescues him and they become friends and D'Arnot teaches Tarzan to speak English. Jane and her party return to England believing Tarzan and D'Arnot have perished in the jungle. Tarzan follows Jane to England and rescues her from a fire and Tarzan expresses his love for her. Jane accept his offer to return to the jungle with him.